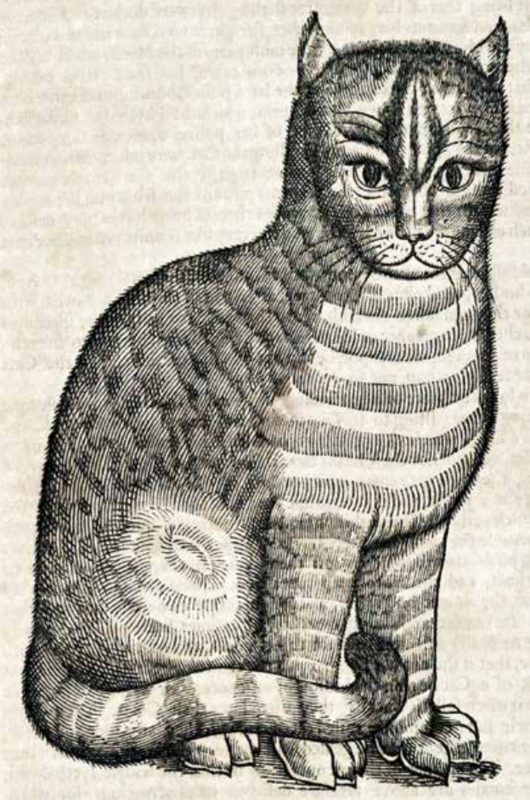 An illustration from Topsell’s The History of Four-footed Beasts and Serpents, 1658. The excellent Public Domain Review is making its first foray into print with a new anthology, The Book of Selected Essays, 2011–2013, celebrating their three years as dedicated spelunkers of the public domain. They’ve amassed an incredible collection of esoterica—stuff that, as their editor Adam Green writes, “didn’t quite make the cut when that mysterious editor on high was working away with razor blade and glue upon the reels and reels of recorded past”—much of which I hadn’t encountered before. How, for instance, had I never heard of Christopher Smart? Smart was an eighteenth-century English poet, an intimate of Samuel Johnson, James Boswell, and Henry Fielding; in 1755 he got a gig producing a weekly paper, The Universal Visitor or Monthly Memorialist, and the job so overworked him that he had some kind of a nervous fit. It’s not clear whether he really went mad or not, but he was admitted to St. Luke’s Hospital for Lunatics—an admirably blunt name, no?—where he wrote one of his more enduring works, Jubilate Agno. Smart never completed the work, which consists of four fragments making a total of over 1,200 lines, each beginning with the words “Let” or “For”. For example, Fragment A is all “Let”s, whereas in Fragment B the “Let”s and “For”s are paired, which may have been the intention for the entire work, modelled on antiphonal Hebrew poetry. References and allusions abound to Biblical (especially Old Testament) figures, plants and animals, gems, contemporary politics and science, the poet’s family and friends, even obituary lists in current periodicals. The language is full of puns, archaisms, coinages, and unfamiliar usages. Dr Johnson famously said “Nothing odd will do long; Tristram Shandy did not last.” Jubilate Agno is, if anything, “odder” than Sterne’s novel, and perhaps we are readier to appreciate it in the twenty-first century than when it was written. Smart was known, with his “disturbed mental state,” for his loud, feverish, constant praying, and you can read some of that catatonia in Jubilate, with its litany of “for”s and its incantatory quality. Elsewhere, the poem is more openly religious: “For Eternity is like a grain of mustard as a growing body and improving spirit,” one line goes, “For the malignancy of fire is oweing to the Devil’s hiding of light, till it became visible darkness. For God has given us a language of monosyllables to prevent our clipping. For a toad enjoys a finer prospect than another creature to compensate his lack. Tho’ toad I am the object of man’s hate. Yet better am I than a reprobate. who has the worst of prospects. For there are stones, whose constituent particles are little toads. For the spiritual musick is as follows. For there is the thunder-stop, which is the voice of God direct. For the rest of the stops are by their rhimes. For the trumpet rhimes are sound bound, soar more and the like. For the Shawm rhimes are lawn fawn moon boon and the like. For the harp rhimes are sing ring string and the like. For the cymbal rhimes are bell well toll soul and the like. For the flute rhimes are tooth youth suit mute and the like. For the dulcimer rhimes are grace place beat heat and the like. For the Clarinet rhimes are clean seen and the like. For the Bassoon rhimes are pass, class and the like. God be gracious to Baumgarden. For the dulcimer are rather van fan and the like and grace place &c are of the bassoon. For beat heat, weep peep &c are of the pipe. You can read the completed fragments of Jubilate Agno in their entirety here; it’s one of roughly thirty texts given careful attention in the Public Domain Review’s book, which they’re offering at a reduced price through November 26.